I will first explain something about hand cannons in general and then go over every single legendary hand cannon and explain their stats and usefulness. 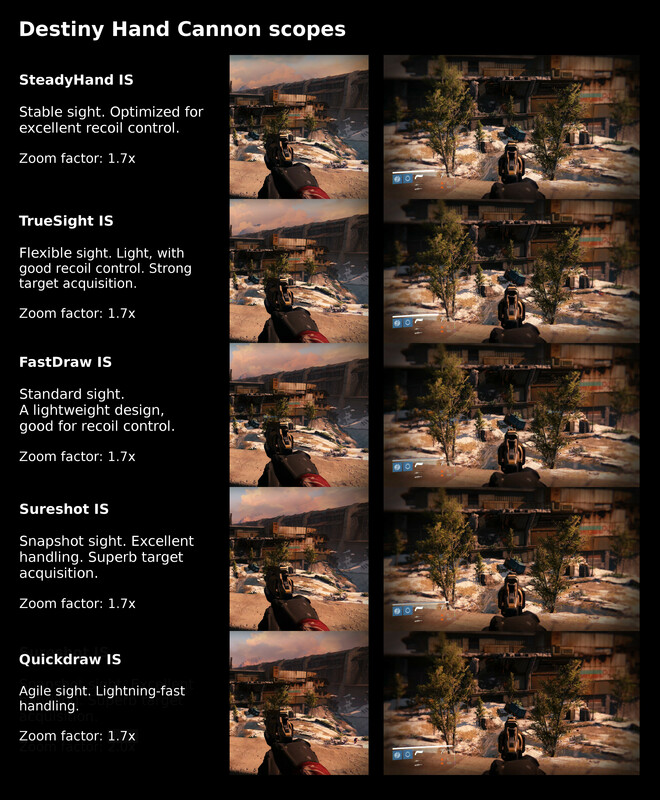 I will also focus on the different hand cannon scopes and their recoil curves. This will hopefully be helpful for you if you want to decide which hand cannons you should buy before HoW comes out or which ones you should upgrade with Etheric Light. Please note that I do not have every single hand cannon and can therefore not give a detailed explanation about how the gun performs. My thoughts are only based on the weapons stats and what I know about them from other players. There are three different types of hand cannons if you classify them by their ROF. Slow firing hand cannons shoot 120 rounds per minute and deal 95 headshot and 64 bodyshot damage in the crucible. Hand cannons with 138 rounds per minute deal 86 headshot and 57 bodyshot damage in PvP and fast firing hand cannons with 164 rounds per minute deal 77 headshot and 51 bodyshot damage in PvP. 7 out of 10 legendary hand cannons belong to the 138 RPM archetype. I will only mention ROF and impact in the analysis of the specific weapons below if it doesn’t belong to the usual type. Every legendary hand cannon will kill players with high armor stats in 3 headshots or 4 bodyshots in PvP. The average legendary hand cannon has a ROF stat of 23, 80 impact, 29 range, 39 stability, 37 reload speed, 75 aim assistance and a magazine size of 9 (all values rounded). There are five different hand cannon scopes available. They are all iron sights, so they don’t change the weapons base zoom factor of 1.7x. There are only slight differences in the appearance of the scopes. I also tested the recoil curves of each scope. Luckily enough, I have all the different scopes on two of my Timur’s Lash hand cannons. This means that no weapon stats or perks influenced the ability to compare the different scopes with each other. Please note that I haven’t tested if the direction in which the recoil goes depends on the weapon or the scope itself. All recoil curves went to the left when using Timur’s Lash. I also tested the aim down sights and reload increase of the scopes by counting frames. The results are rather disappointing and show that the increases of ADS and reload speed only make a slight difference. SteadyHand IS and TrueSight IS both have an ADS time of 7 frames and the other scopes have an ADS time of 6 frames. 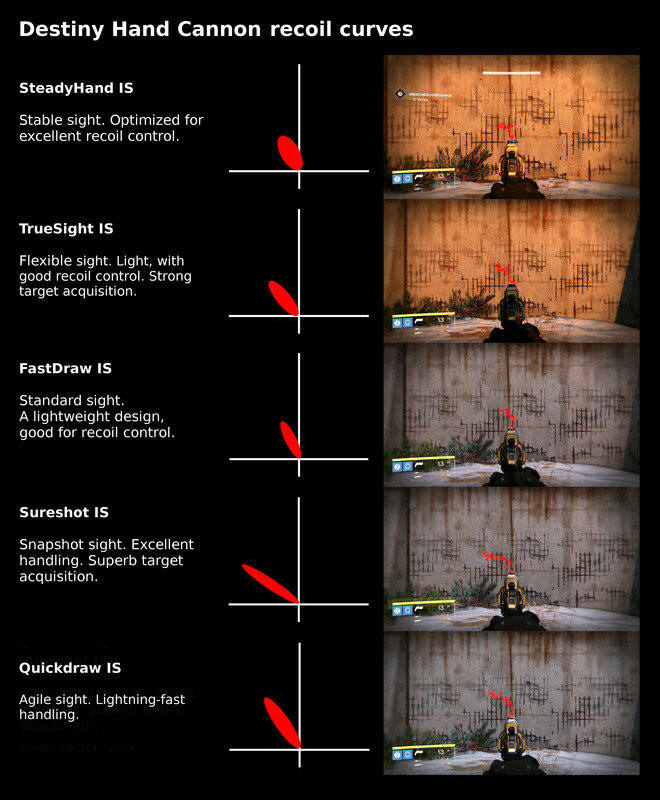 I tested the reload speed by counting the frames from when your guardians left hand leaves the other hand to the point where it comes back to the other hand and not the time between hitting the reload button and being able to shoot again simply because it is easier to see. SteadyHand IS and TrueSight IS both have a reload time of 91, FastDraw IS of 90, Sureshot IS of 89 and Quickdraw IS of 87 frames. I’d therefore recommend using Sureshot IS for PvP, because of its high aim assistance and SteadyHand IS for PvE because of its high stability and recoil control. TrueSight IS and FastDraw IS are fine too, but I would not recommend using Quickdraw IS because the increased reload and handling are not worth the loss in recoil control and stability in my opinion. My recommended perk for the first perk option would be Outlaw for both PvE and PvP. The immense increase of reload speed can easily be activated and is extremely useful if you consider the fact that hand cannons have a relatively slow reload speed and only a small magazine compared to other primary weapons. For the middle perk tree, I would always recommend using Field Scout for PvE, if your weapon has less than 10 rounds in a magazine. Perfect Balance, Send It and Flared Magwell are good options for both PvE and PvP if you want to balance out some of your weapons stats. The second perk option offers a variety of different perks which are worth considering. I’d recommend using either Crowd Control or Grenadier for PvE. CC becomes extremely useful if you have to fight multiple enemies at once and having Grenadier on a primary weapon means than your grenade will be active almost every time you need it. For PvP, I would recommend using Luck in the Chamber or Third Eye. LitC enables you to kill other players in two headshots, but becomes less valuable if your hand cannon has a larger magazine or you are using Field Scout. Third Eye is just a very good PvP perk in general. If you want a hand cannon that works really well for both PvE and PvP, then I would recommend Feeding Frenzy. The FWC vendor hand cannon The Chance has well rounded stats. Stability, reload speed and aim assistance are all slightly above average, but the weapon mostly suffers from its low magazine size of 6 and also from its below average range. Field Scout is basically a must have for this weapon. The FWC vendor sells this weapon with the Field Scout perk. The Chance is a solid hand cannon but there are better options available in my opinion, even if you have one with Field Scout. I would only consider upgrading it if your version has a very good perk roll. The TDB vanguard vendor hand cannon belongs to the fast firing hand cannons with 164 rounds per minute. The weapon has the lowest range, but also the highest reload speed of any legendary hand cannon. The reload speed however is much needed, because of the weapons low magazine size of 5. Again, Field Scout is basically a must have for this weapon, even in PvP. The hidden stats (aim assistance, equip speed and recoil control) are all very high and make up for the low range and average stability. If you have a TDYD with Field Scout and solid perks, then you might want to consider upgrading it when HoW comes out. If not, then don’t even bother leveling it up. The pre-TDB vanguard vendor hand cannon has good stability, high aim assistance and recoil control and is therefore relatively easy to use. The large magazine size of 12 means that you don’t have to choose Field Scout as your middle perk tree choice. Range and reload speed are below average. Depending on your perks, TDYK might be worth upgrading when HoW comes out because it has relatively balanced stats and is easy to use. The Vault of Glass raid hand cannon is probably the best PvE hand cannon in the game due to its perks Firefly and Outlaw. Outlaw is a good perk option in general because it increases the reload speed by a significant amount. Firefly is not available on normal legendary hand cannons and makes it extremely easy to kill larger groups of enemies. The large magazine size of 12 is also a very positive aspect of this weapon. Range and recoil control of this weapon are high, but stability, reload speed and aim assistance are below average. You should definitely upgrade your Fatebringer when HoW comes out. It is one of the, if not the best PvE primary weapon in the game due to its unique perk Firefly and its Arc Damage. In PvP however, it is a rather average weapon because you won’t find as many enemies clustered together like in PvE. The pre-TDB crucible vendor hand cannon has high range and an above average magazine size of 11. The stability and reload speed are about average and the aim assistance is below average. While its TDYK counterpart is more focused on stability, LHF is focused on range. It is a nice and well rounded hand cannon but nothing too special. I would only consider upgrading your LHF if it has good perks. The New Monarchy hand cannon Red Hand IX is currently only available as a random drop from an engram or NM reward package, but will be sold by the NM vendor when HoW comes out. The Red Hand IX has the highest stability of any legendary hand cannon and good recoil control and aim assistance which makes it very easy to use. Range and reload speed however, are both below average. The magazine size of 10 is fine. The Red Hand IX is a good and easy to use hand cannon without any huge disadvantages. If you have good perks on this weapon, then you should upgrade it when HoW comes out. The TDB crucible vendor hand cannon TFWPKY 1969 is really nothing special. Range, stability, magazine size and aim assistance are all about average. The reload speed is even below average. TFWPKY 1969 is only worth upgrading if your version has a really good perk roll. There are many better hand cannons available. The Iron Banner hand cannon Timur’s Lash is the only legendary high impact hand cannon in the game. While impact and range of this weapon are the highest in class, ROF, stability, reload speed and aim assistance are the lowest of any legendary hand cannon. The low magazine size of 7 also requires Field Scout to make this weapon useful in PvE. However, in PvP the weapon can kill players with low to mid armor stats in two headshots. In combination with Luck in the Chamber and the low magazine size, you can turn this weapon into a PvP two-shot killing machine. Timur’s Lash is a really special hand cannon and my personal favorite. It is not easy to use, but with the right perk selection it can turn into a really good PvP and a solid PvE weapon. I will upgrade mine, but it really depends on your perks and your personal opinion about the weapon if you should upgrade it. The Dead Orbit hand cannon is currently only available as a random drop from an engram or a DO reward package. It is very similar to TDYK on terms of range, stability, reload speed and aim assistance and is therefore relatively easy to use. It even has a bit higher stat values than TDYK. Its magazine size of 8 is a bit too low to make it useful in PvE in my opinion and you should use the Field Scout perk, if you have it, when using the Venation III in PvE. The Venation III is a solid hand cannon for both PvE and PvP and might be worth upgrading if you have a good perk roll that includes Field Scout. The Crota’s End raid hand cannon Word of Crota belongs to the high ROF hand cannon archetype. Its range is slightly below average but can be increased by selecting the Hammer Forged perk. Stability and reload speed are good and can be increased even further with the Zen Moment and Speed Reload perks. The unique Phantom Gift perk can further increase the weapons already large magazine size of 12, although it is hard to make use of it in PvP. The Word of Crota is a good hand cannon, but falls short in comparison to its raid counterpart Fatebringer. Due to its Hive Disruptor perk and its void damage, it is worth upgrading for hive-focused activities and nightfalls.